As a major focus of minerals mining in the world, and an untouched treasure trove of natural resources, Africa has a sizeable and thriving mining industry. The mining sector does not only provide employment for millions of African nationals, but is also a significant source of foreign direct investment and earnings. According to mine and industry engineering company Ukwazi nonexecutive director Alan Clegg the commodities that are likely to provide a sufficient upward cycle, thereby sustaining investor interest in Africa, are precious metals, base and battery metals, and energy fuels. The burning question facing the mining sector, however, is whether, and how, it can make its full potential contribution to satisfy the ever-growing need for mineral resources while capturing the wider socioeconomic benefits from such development. 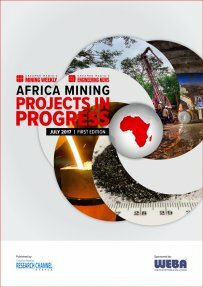 This edition of Creamer Media’s Africa Mining Projects in Progress reviews recently announced scoping, prefeasibility and definitive/bankable feasibility studies on projects across the continent, as well as the projects that are under way. Published on: 31 July 2017.